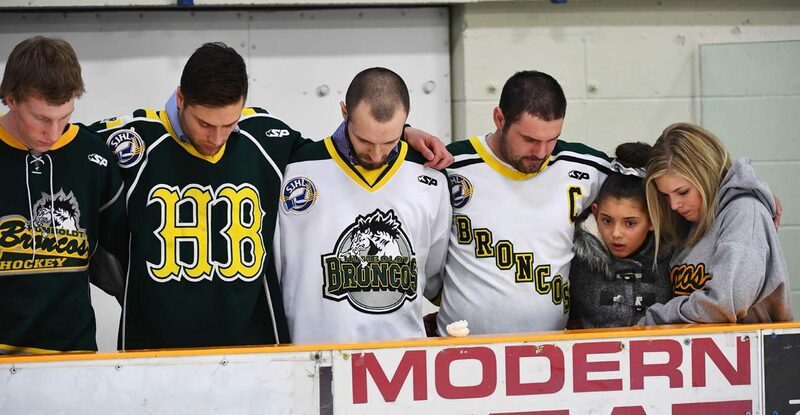 HUMBOLDT, Saskatchewan (CNS) — Crying, hugging and shaking their heads in grief, the people of Humboldt gathered at the local hockey arena April 8 for an interfaith service to mourn 15 people who died after the bus carrying the town’s junior hockey team collided with a truck. “I don’t want to be here, but it’s good that we are,” said the Rev. Sean Brandow, the Humboldt Broncos team chaplain and pastor of Humboldt Bible Church. Rev. Brandow had gone to the accident site shortly after the collision. “I walked up on a scene I never want to see again, to sounds I never want to hear again,” he said. “To hear groaning and panic and fear and confusion and pain. … All I saw (that night) was darkness, and I had nothing. Nothing. “I’m a pastor. I’m supposed to have something. The 15 dead included 10 hockey players between the ages of 16 and 21, the team coach, radio broadcaster, bus driver and other team personnel. The accident occurred early in the evening April 6 when a bus taking the team to a playoff hockey game collided with a transport truck on a highway near the town of Tisdale, Saskatchewan. Fourteen others on the bus were injured. Police are investigating and have not provided any details about the cause of the collision. The bus was traveling north on a highway and passing through an intersection, which had stop signs for traffic traveling east and west. No charges have been filed. Condolences poured into Humboldt from around the world, including messages from Pope Francis, Queen Elizabeth and U.S. President Donald Trump. The Vatican secretary of state sent blessings on behalf of the pope. Saskatoon Bishop Mark Hagemoen, whose diocese includes Humboldt, read the pope’s message during an afternoon service at Holy Family Cathedral in Saskatoon. “We don’t know why tragedy and disaster come, but we do know the one who holds us throughout that tragedy, and we celebrate today that the one who holds us is one of mercy,” Bishop Hagemoen said during the service on Divine Mercy Sunday. Bishop Hagemoen attended the evening prayer service at the Elgar Petersen Arena and Uniplex in Humboldt and offered a final blessing. Earlier, he sent a message of condolences and prayers to those affected by the tragedy. The interfaith service was live-streamed and watched across the province, including at St. Augustine Catholic Church just up the street from the arena. “We just stayed with the people and waited,” he said. “We were there all together, and that is what gave us the idea to organize this vigil. A Go-Fund-Me page was set up to collect donations for families. Organizers hoped to raise $10,000 but, in less than 48 hours, donations exceeded $4 million. The prayer service was attended by Prime Minister Justin Trudeau, Saskatchewan Premier Scott Moe, as well as Hockey Night in Canada personalities Don Cherry and Ron Maclean. Large photos of the team brought tears. Grief and crisis counselors, including grief dogs, roamed the arena. The Rev. Matteo Carboni, St. Andrew’s Anglican minister and vice chair of the Humboldt Ministerial Association, led the service. There was a moment of silence at 7:32 p.m., the time when the puck would have dropped on the Broncos’ playoff game in Nipawin. 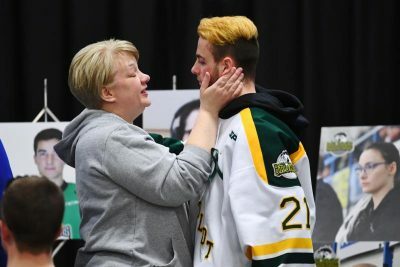 While the largest vigil was held in Humboldt, prayer services for the victims and families were held across the province.